Urdiales, C.; Peula, J.; Barrue, C.; Pérez, E.J. ; Sánchez-Tato, I.; del Toro, J.; Cortes, U.; Sandoval, F.; Annicchiarico, R.; Caltagirone, C.
In nowadays aging society, many people require mobility assistance. Autonomous wheelchairs may provide some help, but they are not supposed to overtake all control on human mobility, as this is reported to lead to loss of residual capabilities and frustration. Instead, persons and wheelchairs are expected to cooperate. Traditionally, shared control hands control from human to robot depending on a triggering event. In this paper, though, we propose a method to allow constant cooperation between humans and robots, so that both have some weight in the emergent navigating behavior. We have tested the proposed method on a robotized Meyra wheelchair at Santa Lucia Hospedale in Rome with several volunteering in-patients presenting different disabilities. Results in indoor environments have been satisfactory both from a quantitative and qualitative point of view. Urdiales, C. [et al.]. 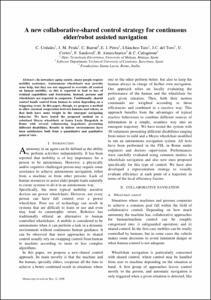 A new collaborative shared control strategy for continuous elder/robot assisted navigation. A: International Conference of the International Society of Gerontechnology. "6th Proceedings of International Conference of the International Society of Gerontechnology". Pisa: 2008, p. 1-5.